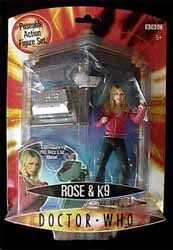 The Rose and K9 action figure pack offers possibly the best value in this range. Not only do you get two figures for your money, but you also get two of the the best looking figures. Both Rose and K9 look like their on screen versions. Rose is dressed in her trademark pink zip-up top and K9 has been designed to look battle damaged. Also the K9 figure is a 'pull back and go' motion figure that will zip across any hard surface. He also comes with a removable access panel that shows some of his internal workings. While it would have been nice if Rose had a few more points of articulation, you can't really grumble for £7. For such a low price point, these action figure are well detailed and will find pride of place in any young child's toy box, or serious older fan's collection. Whether you are buying these to play with, or display in it's packaging, you can't go wrong with this toy.